call from Garden City Chief of Police Michael Utz. “OK, chief, no problem,” Naleye quickly replied. This wasn’t the first time the chief had reached out to the 27-year-old Tyson Foods trainer for help. But the request made him nervous. His initial thought? There was a problem within his Somali community. Perhaps someone had committed a serious crime. Were they all in trouble? Why would the police want them together? And on such short notice? There wasn’t much time. He started making calls. As president of the local African Community Center, Naleye was connected to leaders in the Somali society, composed primarily of refugee families who have migrated to the southwest Kansas city of about 27,000 over the past decade. Some were his friends on West Mary Street in northwest Garden City. Others were his co-workers at the local Tyson Foods beef-packing plant outside of town, where most work the evening shift starting at 3 p.m. They met at the African Shop just down the street, a local business that then served as an informal gathering place. And they were brimming with the very same questions. It’s telling that despite some wariness, Naleye’s initial reaction was trust, especially since he hails from a country that has struggled with government instability for decades. It isn’t simply a matter of luck, either. The trust that Naleye and others in Garden City’s immigrant community have in the police is built upon more than a year’s worth of work. To some extent, you could say the buildup of trust with immigrant populations has taken place over three decades, years before there was a substantial Somali community in Garden City. Through community policing, police develop a familiarity with civilian populations to aid in crime prevention. Garden City officials have worked hard to engage unusual voices by establishing strong relationships with liaisons and volunteers from immigrant communities, such as Naleye. They’ve also undergone cultural training and have tried to connect with these new residents directly rather than waiting for them to reach out. But such strategies face challenges as both legal and illegal immigration become more polarizing in the aftermath of President Donald Trump’s inauguration. It’s resulting in pressure to put state and local governments closer to the front lines of immigration enforcement, a shift that some fear could endanger the relationships that police have built over time to stop other crimes and bolster public safety. Utz says his force already cooperates fully with federal authorities, including Immigration and Customs Enforcement, when individuals have illegally re-entered the country, committed felonies or crimes against persons. However, if the local department was directed to enforce civil immigration violations – overstaying a visa or otherwise having unlawful presence in the United States – it would prove difficult for a variety of reasons, according to the chief. Trust with the public is important to law enforcement, because even when there’s a climate of trust, interactions with police can be fraught with tension for all immigrants, regardless of legal status. Naleye and his fellow Somalis took two vehicles downtown on that October day to meet with police. When they arrived, there were others waiting: members of the sheriff’s department, captains of the police force and a few FBI agents. The police chief thanked the men for their timely arrival to help ease the tension in the room. “You could see the fear and concern that they had as they walked into the building,” Utz says. The chief, too, had reason to be worried. There were limited details he could share. He explained that three men had been planning an attack at their apartment complex, home to about 120 people, including families and children. For several months the FBI had been investigating the men, who lived in neighboring southwest Kansas towns and who were then in police custody. Additional details surrounding their alleged plans would be made public that afternoon: The men had been stockpiling guns and explosives and were planning to detonate bombs at two addresses the day after the November general election. A court affidavit would also reveal that the location had been chosen specifically because of those who lived there – immigrants and refugees – many of them Muslims and Somalis. Naleye, who immigrated in 2010 to seek refuge from decades of civil strife in Somalia, had never before felt unsafe in America. The news about the thwarted attack was shocking. “I was crying inside my heart,” he says, recounting how he simultaneously had to process the details he was hearing and also translate for the parties at the police station. Utz had called the meeting because he wanted the residents of the neighborhood to hear the information firsthand. He and his department needed these men – ordinary townspeople – to help organize a public meeting at the apartment complex the next day and to help minimize fallout from news reports in the weeks ahead. Mursal Naleye’s motivation to work as a liaision between the Somali community and the police is rooted in his desire to live out his Islamic faith. In Garden City, he worships at an apartment-based mosque. The young Somali-American acknowledged the task at hand and immediately took steps to engage the others. His past experiences as an interpreter in courtrooms, health clinics and places of employment for both neighbors and strangers had taught him how to handle important conversations with care. The plan worked. Despite the menacing nature of the alleged attack, there was no widespread panic. Hundreds of residents, some from outside the neighborhood and others from local church groups, came to show their support the day after the news broke and listen to law enforcement officials speak and answer questions. People continued to go to work and to school. Few if any families left town because of safety concerns, and reports of community support for the families flooded the national media in the following weeks. 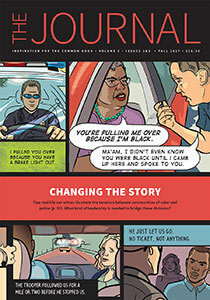 It’s what Utz, in his second year as chief of police, describes as a “grand slam” case of how community policing works. ABOVE: Community policing, such as a law enforcement explorer program for those ages 14-21, has been an important part of the department’s effort to build relationships with the public in Garden City. RIGHT: Mursal Naleye uses a smart phone app to determine which direction he needs to pray to face Mecca. A growing Muslim population represents just one of the major demographic changes unfolding in Garden City because of growth in its immigrant population. Utz’s approach is one that most law enforcement agencies have adopted to varying degrees over the past few decades, according to the U.S. Department of Justice’s Office of Community Oriented Policing Services. While strategies and implementation can vary widely across the nation, the objective in every agency is the same: “solving problems through collaborative partnerships built on mutual support, trust and respect,” according to the Justice Department. Keeping a community safe can become especially challenging in diverse places such as Garden City, a regional center within a rural geography, where less than half the population – about 43 percent – identifies as white alone, according to the U.S. Census Bureau. The town is often characterized as a community in flux because of its changing demographics, largely the result of low-skilled jobs in the meat-packing and production industry that are the economic mainstay of the region. Most recently the Tyson Foods plant has been a magnet for Somali, Burmese and other African and Asian refugees resettling in the United States who are looking for steady employment. For sure, there are some who feel a sense of loss – or even threat – by such significant demographic changes to the community. Local officials often bring attention to the positive contributions of immigrants to the city’s economic and demographic growth since its founding in 1878. In 2011, as a show of agreement, thousands of residents voted to adopt a new tagline – “The World Grows Here” – a reflection of the city’s cultural and linguistic diversity against its agricultural backbone. But changes in federal policy, especially toward immigrants, stand to threaten decades of trust-building and rapport in communities like Garden City. In his first week in office, Trump signed an executive order – Enhancing Public Safety in the Interior of the United States – aimed at broadening immigration enforcement priorities and encouraging states and local law enforcement agencies to enforce federal immigration laws where possible. The order also established the Victims of Immigration Crime Engagement Office, a support agency for victims of crimes committed by illegal immigrants. Supporters see these directives as a way to protect public safety, but in the view of former Garden City Police Chief James Hawkins, they are simply misguided. The retired chief, who left the force in 2015, belongs to the Law Enforcement Immigration Task Force, a group composed of law enforcement supervisors from across the country – from San Antonio to St. Paul, Minnesota – who have voiced their opposition to such policies. Since at least the early 1990s, the department has attempted to engage unusual voices by making use of a police-citizens advisory board, composed of volunteers from various community factions – Hispanics, African Americans, schools, churches and businesses, to name a few – who serve as liaisons to their representative groups and as a sounding board for the police. Once he became chief in 1996, Hawkins decided that if the force was going to preach community policing, it had to practice it fully by engaging more voices. That meant starting annual cultural awareness training to learn more about the newcomers and help them assimilate as they learned more about Garden City’s rules and regulations. 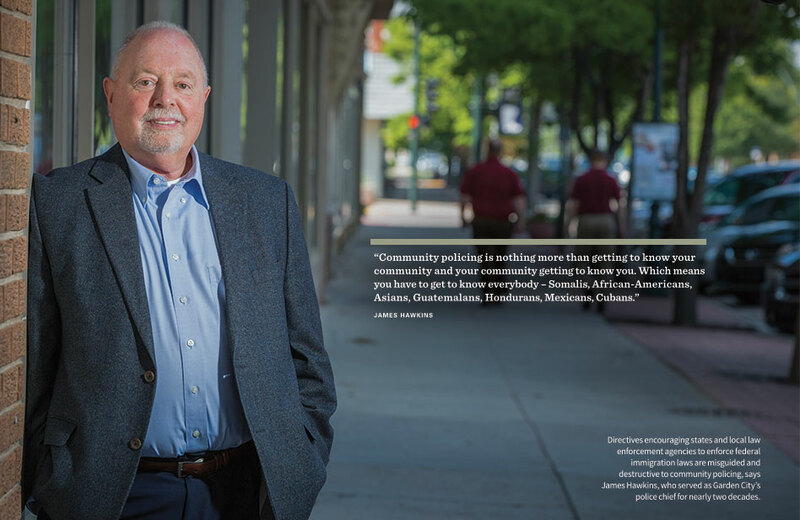 As a fluent Spanish-speaker, the retired chief also participated in call-in programs on a local Spanish-language radio station as a way to connect with the Mexican and Central American populace. The former chief, who still lives and works in Garden City, says there’s no subculture or society within the community that is immune to crime. However, he says, most immigrants, even those in the country illegally, are otherwise law-abiding residents, often with families and children. The idea that police should prioritize enforcing local and state laws over directing their attention to ensuring that immigrants are in the country legally is a divisive topic. Kris Kobach, the secretary of state and a candidate for Kansas governor, crafted a pair of bills this year that would have affected state and local officials. One proposal would have required the Kansas Highway Patrol to partner with the U.S. Department of Homeland Security, ICE’s parent agency, on immigration enforcement. Another would have prevented cities from adopting policies that prevent law enforcement officers from inquiring about a person’s immigration status or cooperating with federal authorities. Neither bill advanced in the 2017 session but could be reconsidered next year. Supporters of such measures contend that tighter immigration enforcement would help discourage illegal immigration. But Hawkins says there’s a downside to making state and local police the frontline for policing the nation’s borders. When immigrants – especially undocumented immigrants – are afraid to report crimes, call an ambulance or assist with ongoing investigations, it can serve to undermine, rather than improve, public safety, Hawkins says. In the meantime, the work of building trust through community policing is continuing in Garden City. In the aftermath of the events that brought Garden City into the national spotlight last fall, local law enforcement officers began monthly visits to the apartment buildings on West Mary Street, according to Utz. Police officers still call on the families and kids living in these neighborhoods to talk, connect and sometimes even play soccer. The informal gatherings now take place about every three months. It’s just the latest effort to build community bridges with the newest residents of Garden City. Utz and his force began meeting periodically at the African Community Center in early 2016. At these meetings, officers and members of the Somali community discussed a range of topics, from the police department’s role and accountability to residents’ concerns about driving, traffic regulations and burying deceased loved ones, Utz says. During that fateful Friday meeting before news of the domestic terror bomb plot emerged in public media, Utz hoped the relationship he, his officers and Somali community leaders had forged was enough to get law enforcement’s message across and avoid community panic. So far, news out of the nation’s capital and presidential executive orders have not impacted crime reporting across the community, according to Utz. In fact, crime rates in Garden City have dropped steadily and significantly overall since the early 2000s – almost in half – according to the chief. For a diverse community where cultural and linguistic barriers are common, Utz thinks that is significant. It’s why his organization continues to urge all residents to be vigilant of their surroundings and always call law enforcement for assistance when necessary. Lower crime rates and safe neighborhoods are two of the reasons Garden City continues to attract immigrants and refugees who want to build better lives. Even after the news of last October, the Somali community has not dwindled. If anything, more families have moved to the area, Naleye says. Naleye’s role as a liaison between the police and the Somali community demonstrates the power of community policing to give the work of enhancing public safety to the residents themselves. For instance, just a few hours after he had been told of the alleged plot, the young Somali-American ventured into work at the packing plant, where he had started on the production floor in 2013. A televised news conference was to begin any minute, and so Naleye quickly walked through the facility visiting with shift supervisors and managers to explain why some of his co-workers might be missing from work or distracted. At the beginning of this year, with the encouragement of Utz, Naleye joined the city’s Cultural Relations Board, an all-volunteer group that serves to promote cultural diversity through community-wide events and dialogue. His motivation to work as a community liaison, to volunteer and to lead the Somali community in Garden City is strong and has spiritual roots. However, his efforts are not without challenges. Members of the African Community Center no longer have a physical space to meet, after being unable to renew their last lease. Money is a major problem. Naleye, along with seven other board members, volunteer their time to assist other residents with the logistics of paying bills, resolving traffic tickets and translating during health care appointments. However, the group has not figured out a fair or proper way to generate revenue for the organization so these activities can be sustained. And there is still a lot of work to do. Many neighbors lack basic English-language skills and lack the confidence and knowledge to navigate what for them are complex and new legal systems in southwest Kansas. But Naleye, who has made Garden City his home, is up for the challenge. This entry was posted in community policing and tagged garden city, immmigration debate, policing. Bookmark the permalink.